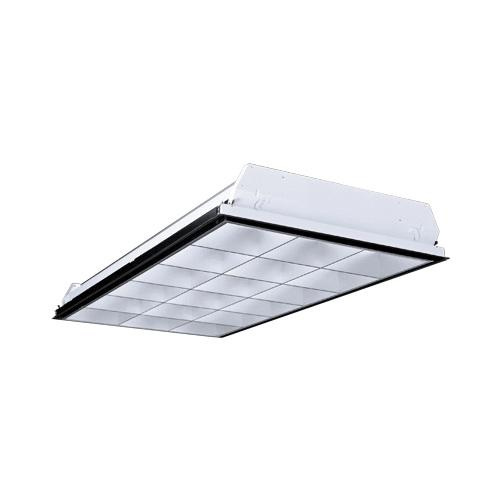 Philips Lighting Daybrite Collection LP3 paralouver fluorescent parabolic troffer features 2-5/8-Inch louver that provides balance of shielding, efficiency and cost. It has premium guide-post spring loaded latches standards. Housing is multistage phosphate treated for maximum corrosion resistance and finish coat with high reflectance baked white enamel. Flat black finish inside perimeter reveal for floating door appearance. It has built-in grid clips design for use with standard 1-1/2-Inch high grid ceiling members. Standard wireway cover is designed to accommodate small can ballasts. Troffer is cULus listed.